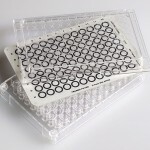 The ChemoTx® System is a disposable 96-well cell migration system. 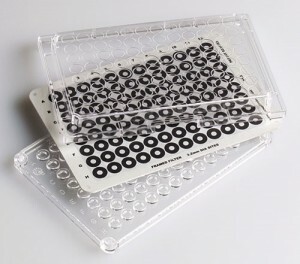 Based on the standard 96-well microplate format, it is compatible with most 96-well fluorescent and densitometric plate readers, as well as most liquid-dispensing robots. 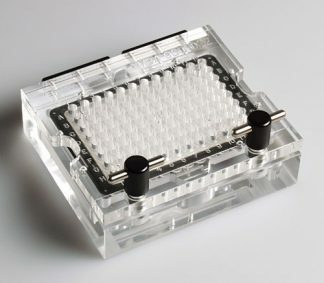 The system consists of all the chamber components necessary to perform a basic chemotaxis assay: a microplate, filter, and lid. 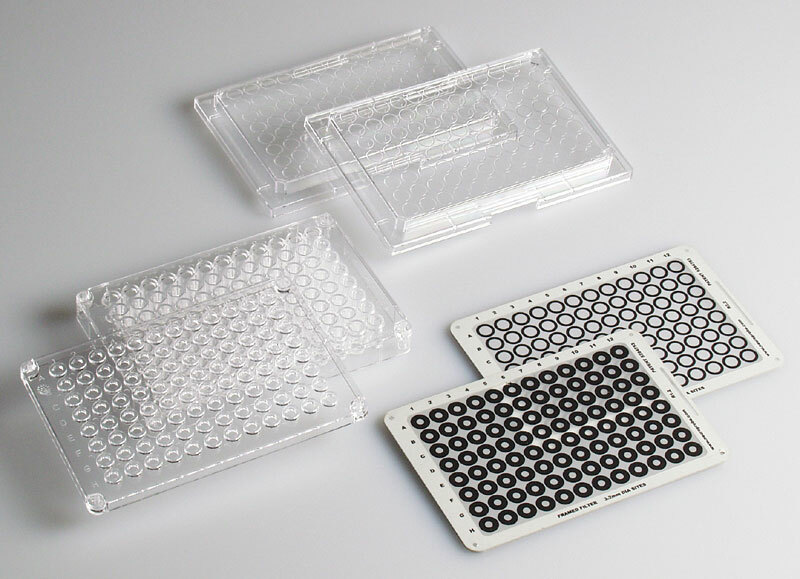 Plates are molded from tissue culture grade transparent polystyrene, with 30µL or 300µL well capacity. The filters for this system are available in a wide range of pore sizes. They are bonded to frames for ease of handling and selectively coated with a hydrophobic mask around each of the test sites. 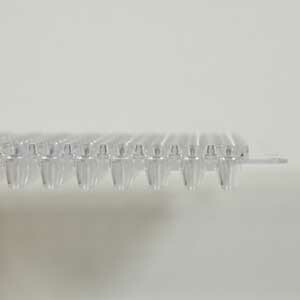 The hydrophobic mask restricts the cell suspension to these sites, eliminating the need for upper wells. Test sites are available in two exposed filter areas, 8mm2 or 25mm2. The hydrophobic mask allows pipetting of cell suspension directly onto the sites on the top side of the filter, where it sits in hemispherical drops, eliminating the need for upper wells. Additional hydrophobic coatings, combined with the proprietary design of the plates, provide the seal between the bottom of the filter and the rims of the plate, so there is no need for gaskets and clamping hardware. Bubble entrapment is minimized in both the top and bottom fluids by this design. The lid aids in reducing evaporation and facilitates stacking. There are a total of four possible combinations of plate well volume and exposed filter area. For most fluorescence assays, the 101 series, with 30µL plate well volume and 8mm2 filter area, works well. If the number of migrated cells does not create sufficient signal strength relative to the background, the 106 series, with 25mm2 area, will yield increased signal strength. If you will be incubating for longer than 3-4 hours, a unit with the larger, 300µL plate volume will allow for more media to sustain the cells. When quantifying the migrated cells with a densitometric reader, the 116 series will provide a larger exposed filter area for increased signal strength and deeper wells to simplify the staining process and enhance reading. 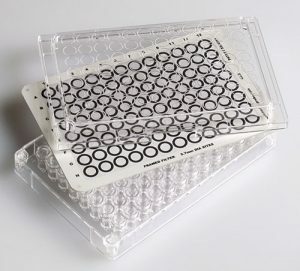 If using the 300µL well volume is not desirable, e.g., when using rare or expensive reagents, an alternative is to use the 106 series with 30µL well volume for the migration and then use the 96-well funnel plate (FP1) to transfer the migrated cells into a deeper plate for staining and counting. 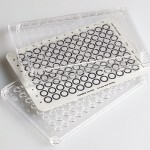 Polycarbonate membranes are available in a wide range of pore sizes. Information regarding pore density as it relates to pore size may be found on the Filters page. Find more information on Framed Filters here . 2µm pore size has PVP treated membrane. Please contact us with any questions. * Non-stock items – please call for availability.